We all know CarMax is great for buying incredibly unreliable Range Rovers or fast, unreliable European hardware well beyond the factory warranty. But if you want something that’s not so old or not so rare, is the “no haggle price” really the best deal? Suppose you were in the market for a nice mid-size sedan. The Accord is always a safe bet, it’s reliable, good on gas and if you opt for the Sport model it is not completely boring. CarMax will sell you this 2014 Accord Sport CVT with 7k miles for $24,899. You might forget that a 2015 Accord Sport CVT has an MSRP of $25,485. So even if you paid sticker price for that Accord, the brand new car with zero miles would only cost you an extra $586. Of course no one really pays sticker for an Accord, in fact getting a new one for less than invoice is pretty easy. Sonic Automotive, which also bills themselves as a “no haggle” new car dealer has this 2015 Accord Sport CVT in the same color for an advertised price of $20,991. Not only is this car almost four grand cheaper than the one at CarMax, but the interest rate on new vehicles are usually better than used. What about a truck? Americans love trucks. CarMax has this very nice 2010 Chevrolet 1500 LT Crew Cab with 83k miles for $25,899. But if you are willing to take the drive out to Virginia you can save your self a grand by going for this 2012 15000 LT 4-door with 13k fewer miles. Perhaps trucks aren’t your thing and you prefer something smaller and sportier in the way of a crossover. CarMax in Beaverton OR, has this 2014 CX-5 Grand Touring AWD with Tech Package and only 21k miles for $27,998. That’s not a bad deal considering a brand new CX-5 with the same equipment has an MSRP of almost $32,000. However, Kuni BMW, also in Beaverton, has a newer 2015 CX-5 Grand Touring with Tech Package and only 11k miles for about $250 less. Okay, so enough with the boring stuff. The reason we Jalops shop CarMax is so we can get that fast unreliable European car we have been dreaming about. Is CarMax still the best value? It all depends on the car. Do you like diesel sport sedans? Of course you do! CarMax has this 2014 328d with Navigation and sunroof for a about $35,000. If you aren’t picky about color you can have this similarly equipped CPO 2014 328d with 19k miles for almost the same price. The primary difference here is that the white BMW comes with certified pre-owned warranty coverage and the remaining balance of the complementary maintenance plan included in the price. The CarMax BMW only has the balance of the factory warranty, but no additional coverage. A MaxCare plan on that 328 is going to cost you extra. Believe it or not, CarMax isn’t just for folks that want a quality used car at a reasonable price. There are some car buyers that will drop serious cash. So what can you get if you have Porsche money? At the San Diego CarMax there is a gorgeous 2013 Porsche 991 Carrera coupe equipped with PDK, navigation and a Bose stereo with 23k miles for $74,998. Or you can take the trip out to Long Beach for this CPO 2013 991 Carrera coupe with 19k miles for an advertised price of $73,739; it also has PDK, navigation and a Bose stereo. Again the key difference between the 911 cars is not necessarily the price, but the warranty coverage. As Doug has mentioned many times, the MaxCare coverage is really good, but it is going to cost you more money in addition to that non-negotiable CarMax price. Whereas the CPO 911 has the factory CPO coverage included in the price and isn’t cheap for high-end hardware. It is also worth noting that Porsche’s CPO coverage is one of the best in the industry. The point of this post was not to suggest you never buy from CarMax. It’s to let you know that for every awesome deal on an out of warranty M3, there is a huge variety more common cars that you can be purchased elsewhere at a better value. CarMax has some solid advertising that pitches the franchise as some revolution in used car buying. While there is something to be said for a “no haggle experience, sometimes CarMax has great deals, and sometimes they don’t. I will say that their Miata inventory was competitively priced and this hard to find “Jalop Spec” BMW 320 6MT is worth a look. For vehicles that have surpassed their factory warranty period, CarMax offers a nice alternative to your typical used car choices. 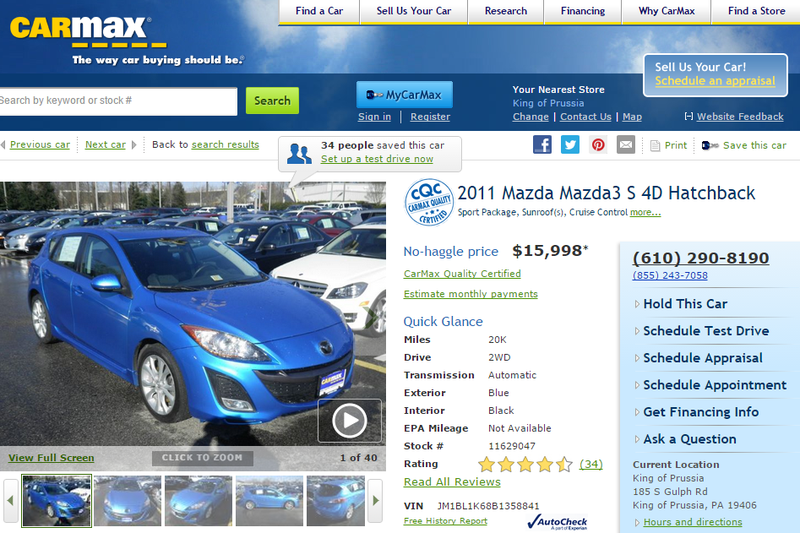 However, when CarMax has to compete with new or CPO inventory, it pays to shop around.